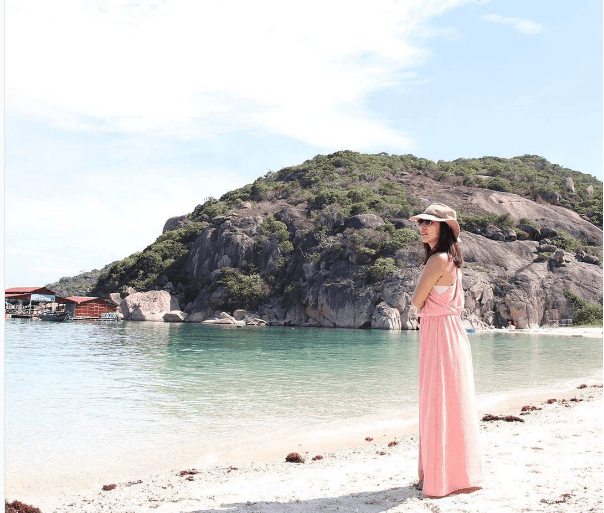 Are still wondering where to “wander” to own amazing “virtual” check-in photos in Dinh Ba island? If any, why don’t you note down these following addresses? In addition to outstanding natural beauties, Binh Ba has driven tourists “crazy” with “picturesque” blooming cotton flowers. 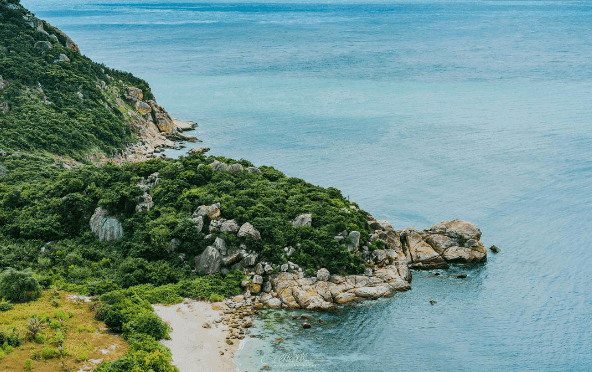 The cotton hill near Tortoise (Rua) Island – the island in the shape of a turtle, is filled with pink cotton flower dramatically highlighting for the immense blue sky in Binh Ba. 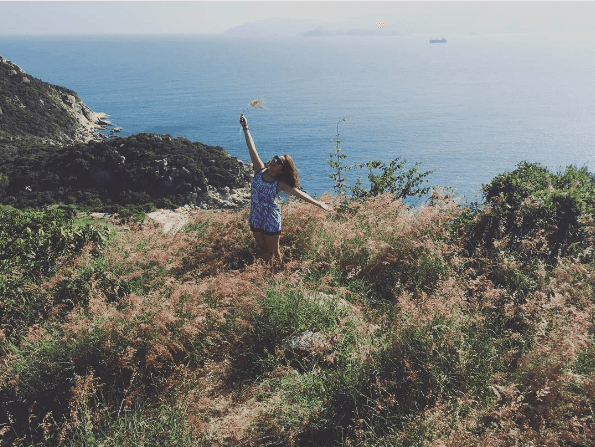 To take photos of this charming scenery, visitors might walk to the right of the road leading to top of the slope, from Binh Ba Island. Standing here, you can hold a panoramic view of the stunning sunset and the beautiful Rua Island. 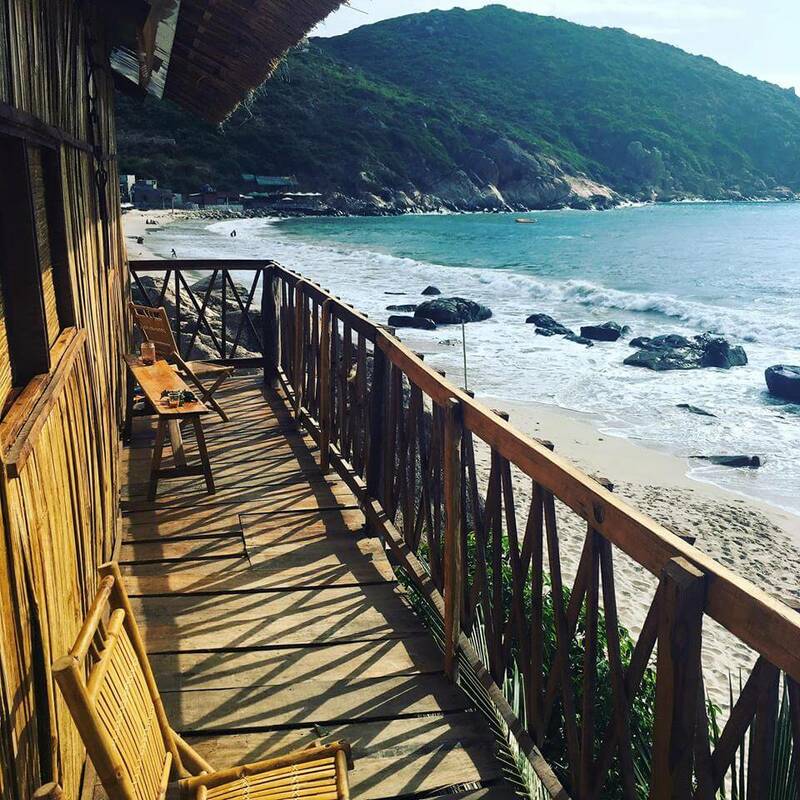 Conveniently located on the beach, resthouses in Nom Beach has been famous for unique wooden architecture and “one – of – a- kind” amazing sea views in Binh Ba. These rest houses own an ideal position, surrounded by two majestic mountains, smooth white sand and foamy wave soaring the feet of the cliff all day long. 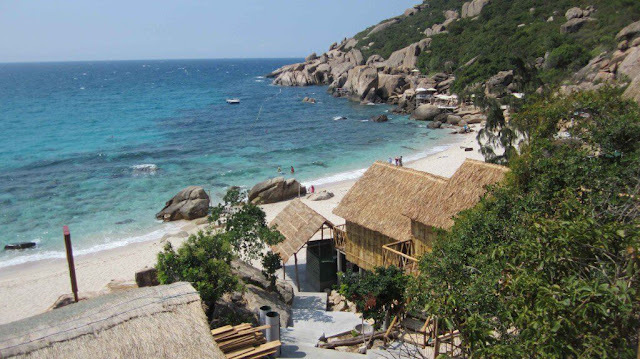 Made from natural building materials such as leaf roof, bamboo walls, wood, etc, wooden houses in Nom beach has obtained favorable impression from tourists who did experience the comfort and hospitability it offers. Although Ham Heo Abyss is located on the Binh Ba Island, it has not been familiar to tourists because of having a deep abyss gap near the sea. Previously, wild boars used to live in this area, with the cliffs of up to 20m high, they were fallen down to this deep gap. Therefore, it is called Ham Heo Abyass. The ideal time to enjoy the most exhilarating beauty of this abyss is in the early morning when the sun comes up from the foot of the mountain. Standing on the highest peak, you certainly hold a panoramic view of the majestic nature in the East of the island. The image of waves crasing the cliffs makes us feel like a tiny part of the vast nature. 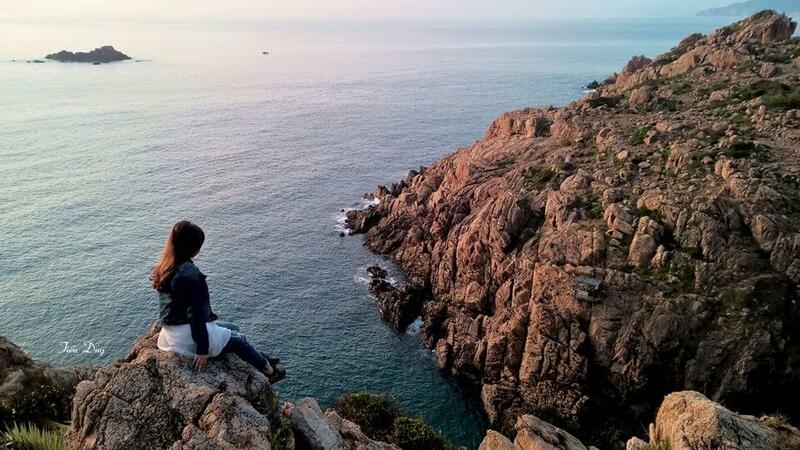 To get there, you might go to Chuong beach, then, follow the slope heading to Ham Heo Abyss. Entering Binh Ba island, walking along the road to the left till the top of the slope, you probably reach Rua (Turtle) Island. As the name would suggest, this island is in the shape of a sea turtle trying to swim onto the sea. Because this amazing island is hidded on a valley, tourists can take “virtual” pictures with it from far distance. 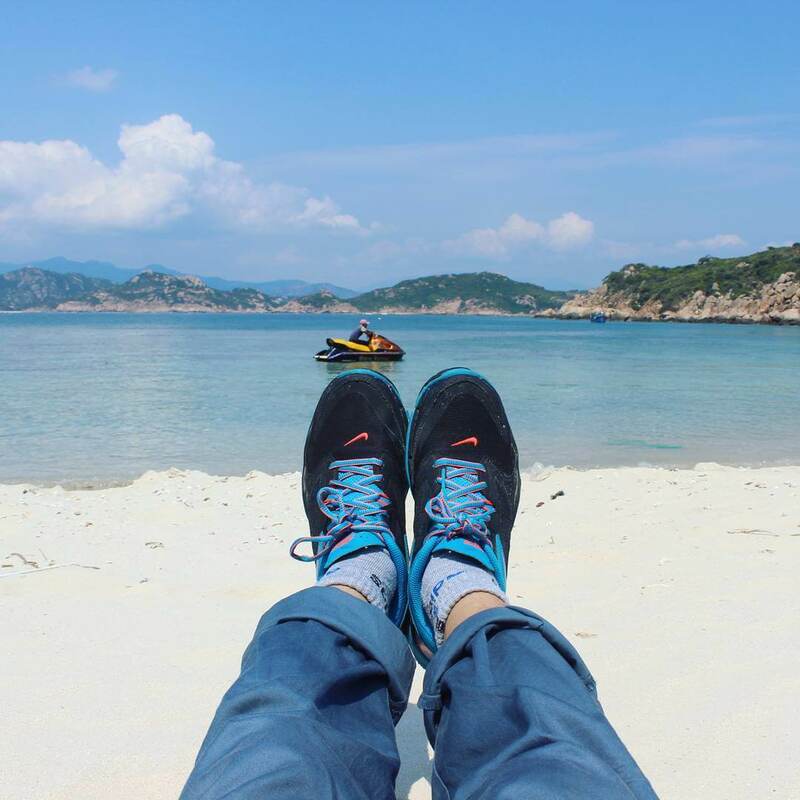 In the afternoon, you can stroll, swim, or even try adventurous games if you want to challenge yourself and experience thrilling activities at Nom beach. This beautiful sea is surrounded by two mountains that make it calm all year round. However, this prevents tourists from greeting the dawn in the early morning. As a reward for this disadvantage, Nom owns the soft white beach, so it is crowded with tourists and local people at about 4 p.m. When renting boats you can also tell the fisherman to take you to lobster ponds where you will be introduced the whole process of raising lobsters. In particular, these ponds enable you to buy fresh seafood at discount prices for family and friends. It’s absolutely ideal to have dinner on the beach and enjoy the breathtaking beauty of the beach at night. You definitely afford them because there are many restaurants with “reasonable” prices on the island. Sa Huynh is a magnificent beach and the paradise of the natural coral reef. It is in the shape of a piece of the moon and naturally favored a soft white sand smoothly embracing the calm blue sea. Furthermore, two sides of the beach are protected by rows of majestic and unique ancient stones. 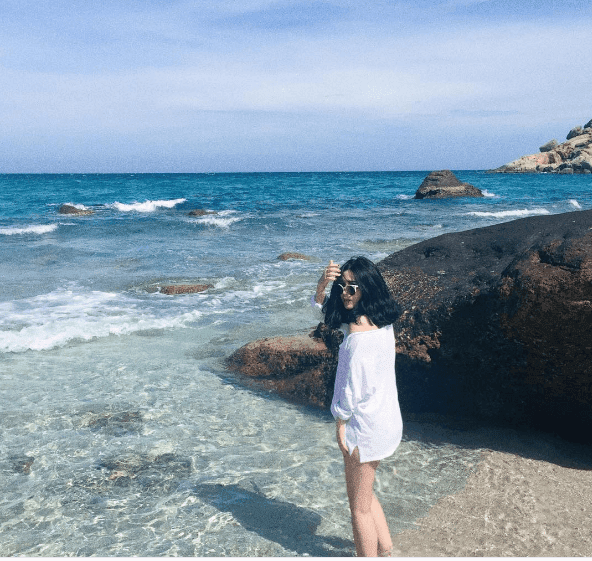 The disadvantage, which is also considered the advantage of Sa Huynh beach, is that it’s located in the military area of Cam Ranh peninsula. Therefore, you have to get on board or canoe to get there. Once you get there, however, you are probably “madly in love” right away because of the pristine blue sea without having a person.